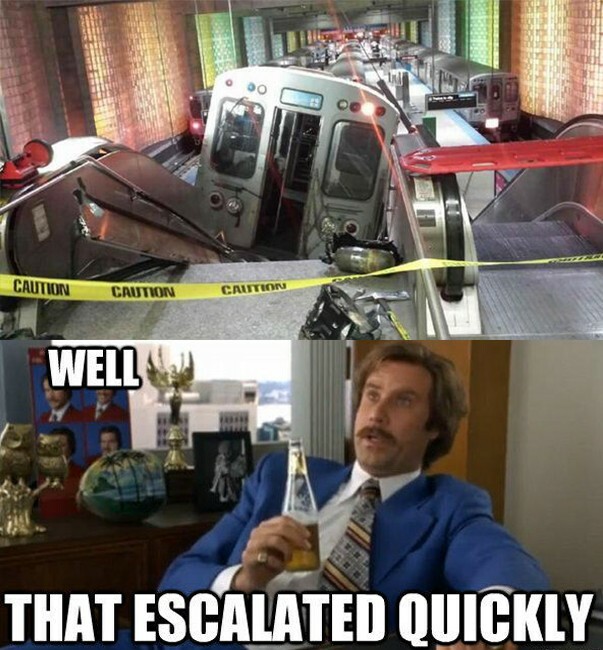 Tying a few recent threads together, there have been a lot of jokes on the internet in the wake of the recent derailment of a CTA Blue Line train at O’Hare Airport station in Chicago. But of course, as Eric Jaffe pointed out in The Atlantic Cities, we have the luxury of laughing because the train went off the end of the trackway in the dead of night, with a relative handful of people on board, resulting in none of the 30 injuries being life-threatening. We can also avoid the sorts of knee-jerk responses we see after accidents with nonzero death tolls, like last year’s derailment at Spuyten Duyvil in New York. Both the O’Hare crash and the Spuyten Duyvil derailment have been linked, in early media reports, to operator fatigue. While there are many technical safeguards in place, and more coming online in the next few years, to prevent operator errors from causing accidents, it’s clear that those measures are not yet 100% effective. As SEPTA prepares to join CTA in the elite club of 24-hour subways, it’s worth noting that people are more fatigued overnight than during the day, and that there is a straight line between fatigue and error rates. (I have plenty of experience with this phenomenon, being someone who sees quite a lot of the other side of midnight.) SEPTA is going to see an increase in operator error rates if it runs overnight; that is an unavoidable fact. Except, of course, that it is entirely avoidable, by removing the operator from the circuit entirely. This is a drum that Stephen J. Smith has been banging on for quite some time, but he’s right that the time is long overdue for automated trains to come to America. Automating trains, unlike automating cars, is a mature and well-understood technology, and has not only been installed on many new-built transit lines, but has been retrofitted to older lines. One of the better-known examples of a retrofitted line, at least among transit nerds, is the Paris Métro’s Line 1, which first opened in 1900, seven years before the Market Street Elevated, and completed the changeover to automated operation in 2012. Like many automated lines, new and old, Line 1 paired automation with the installation of platform edge doors (PEDs), which is not a technical requirement of automation. Still, PEDs are a big safety and liability-reduction upgrade that comes relatively cheap bundled with automation, especially at the claustrophobic deathtrap that is City Hall Station BSL, as well as other platform pinchpoints throughout the system, mostly caused by poorly-placed stairways and elevators down to track level. We may have avoided the New York City Subway’s critical design error of placing ubiquitous support columns in close proximity to the platform edge in most places, but not quite everywhere. If PEDs can make the passenger experience at the Broad Street Line’s busiest station better, without bringing the eponymous building down, then I’m all for installing them at the first opportunity. About a dozen or so people per year die after being struck by SEPTA trains, and cutting into that number is also a worthwhile enterprise, although it’s noteworthy how much smaller that number is compared to the traffic violence on the streets and highways. Driverless trains also provide financial encouragement to transit agencies to operate far more frequent service in off-peak hours. This effect is strongest in systems where train length can be adjusted based on hourly demand, as SEPTA theoretically can, but currently does not. With driver compensation out of the marginal cost equation, it’s approximately the same amount of money to run three two-car trains as one six-car train, but three times as many train departures is obviously much more attractive to riders, even if they have to walk down platforms a bit more than they already do. But this week, there’s another issue that insistently argues in favor of automating Philadelphia’s rapid transit lines: industrial action. Labor negotiations between SEPTA and TWU 234 are continuing, and the rumor mill surrounding the process (TWU head Willie Brown is talking to reporters; SEPTA is not) suggests that, despite there not yet having been a strike authorization vote presented to the TWU 234 rank and file, the two sides are far enough apart that a strike sometime in the month of April is likely. In response to the imminent threat of the third SEPTA strike in eight years, State Representative Kate Harper (R-Montgomery) has introduced legislation that would completely remove TWU’s right to strike. Nevermind that TWU is reaching Italian levels of triggerhappiness when it comes to industrial action, and thus has a public approval ranging somewhere between Jack the Ripper and the United States Congress. I strongly believe that completely revoking TWU’s right to strike is an overreaction to its abuse of that right. It also might endanger SEPTA’s federal funding, to the detriment of labor and riders alike, although that’s more ambiguous. But driverless subway trains, while not actually laborless, can be run with skeleton crews of management replacements, which is an infamously bad idea for human-operated trains. Driving a train is highly specialized skilled labor, but cleaning a train at its terminal is not. If the subways kept running, even perhaps at reduced capacity, during a strike, alongside (mostly) strike-proof Regional Rail and a bikeshare system coming online a year too late to pick up slack during this round of troubles, then Philadelphia would be functional in a way that it is not during a transit strike today. That reduces the power of TWU’s bargaining position, but not nearly as much as it would be reduced by Rep. Harper’s bill, or by a clone of New York State’s Taylor Law, which may be the alternatives facing TWU. This is not a surrender by labor so much as it is nuclear disarmament; if conflict is inevitable, as Willie Brown seems to think (and this is his second act at the helm of TWU 234), then conflict should be thinkable. The other route, the nuclear deterrence option of Mutual Assured Destruction, doesn’t seem to be enough to keep TWU off the picket lines. So yes, let’s add automating the subways to the queue of capital improvements in the Catching Up plan. It’s a nontrivial investment, but it will be paying dividends in blood, fortune, and labor relations for decades to come. The non-token booth is possibly the most aggravating aspect of being a Subway or El rider; a person is required to accept cash fares and to sell and accept paper transfers, but does not sell tokens or any other fare instruments, nor do they seem to be able to tell the confused rider the most basic information. This seems to be a setup for frustration and crushed hopes. The most visible of all SEPTA frontline employees, and the most findable, can not help with the most basic of customer service tasks. No wonder that local message board regulars have dubbed them “booth trolls”, whether that is for their resemblance to mythic creatures or internet pranksters. Rev. Caine probably has a leg up on the average harried commuter or confused tourist in terms of ability to retain equanimity in such trying circumstances. This raises the question: whither the booth workers, come the Fall and NPT? With NPT bringing fare vending machines to every Subway and El station, and the end of paper transfers, the booth troll may be an endangered species; they will have no functions left to do. Such is the price of progress. Hopefully, if SEPTA allows the booth workers an opportunity to transfer to other jobs in the agency, they won’t be customer-facing, unless intensive customer service retraining is required.